Here is a fun and fast snack idea that I eat all the time, especially when I know my body needs some protein. This can be a great pre or post workout snack, or just a fun way to "indulge" because these roll-ups taste seriously naughty. Have fun! Step 1: Lay out Tofurky slices. 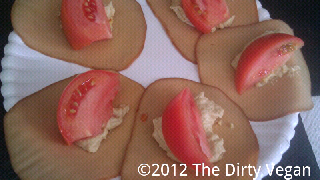 Step 2: Place dollops of hummus and tomato wedges in the center of the slices. 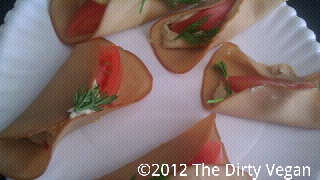 Step 3: Roll up using hummus to stick slices together and top exposed hummus with fresh herbs. I used dill. Comment below or holler at me on Twitter and Facebook if you have any neat suggestions for variations of this snack. I love hearing them! My snack that I just ate contained a total 18g of protein. Quite good for just a mid-morning snack, especially since I eat vegan protein with each meal. Feel free to share this post with anyone who thinks that plant based diets equate to lack of protein. Dirty Vegans are definitely proof that we love our food, and we don't skimp! Hope you can fit a fun roll-up into your day (or at least your week)! And for now, the Dirty Vegan is signing off. This is the time of year that everyone is thinking about getting healthy. The holidays are over (for the most part - hello, yummy vegan Valentine Chocolates! ), and people are back at the gym in full force and wanting to eat a little healthier. Pure Fit Nutrition Bars was kind enough to send me some of their yummy fitness bars to try and here is what I think. 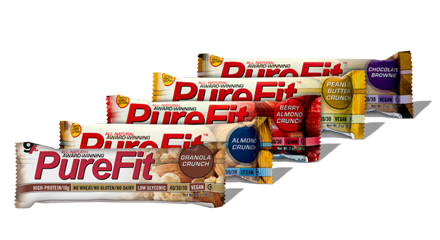 I received Pure Fit Bars in the following flavors: Granola Crunch, Peanut Butter Crunch, Berry Almond Crunch, Chocolate Brownie, and Almond Crunch. The bars are vegan, gluten-free, and contain a ton of nutrition, including 20% iron and a whopping 18g of protein! When I was in high school, I was very athletic, active, and health conscious. At that time, I was not full vegetarian yet, I ate protein bars, ran track, and went to the gym. My fitness level and figure was not near as amazing as it is today, as a Dirty Vegan. I eat pretty Naughty now, but am in the best shape of my life. Back then I was all into health and fitness, but could not attain the levels of fitness and make my body look the way it looks right now, as I live a completely Dirty Vegan lifestyle. I think that is quite funny for all those naysayers who have negative things to say about veganism. Now, as a Dirty Vegan, I want to be back in the health freak club sometimes. I sometimes miss that whole gym-going lifestyle of grabbing a protein bar that had that specific taste, and going to the gym. Just the act of it, for me is nostalgic to my teenage years. Even though I wasn't at peek fitness level (or what I would even consider acceptable by my current standards) back then, it was the motivation that I held and having these supplements and products behind me was important. 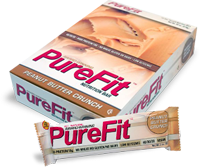 So when I took one bite of the Pure Fit Berry Almond Crunch bar, I felt like I just took a bite of my adolescence. I felt the sudden urge to hit the gym (which you all know is very unusual for me). To have a vegan bar like Pure Fit that contains a great amount of protein and nutrients, be gluten-free, and be extremely competitive to the non-vegan bars out there, is really cool to me. Most of the competition is junk - Pure Fit is like winning the vegan health lottery. So if you are looking for a product to help you reach your 2012 fitness and health goals, I would definitely recomend these bars. Peanut Butter Crunch are my favorite flavor from the line! Yum! So what are your New Year's fitness plans? What is your resolution this year? Are you sticking to it so far? It really takes my mother thinking I was dead because I wasn't blogging regularly, to be the push I needed to get back in the game. I thought, gees if this is what my mother thinks, imagine my poor readers! Ha! 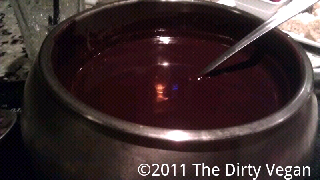 So, based on the title of this post, you are probably thinking, "Dirty Vegan, why must you tease us about vegans being able to tango at the fondue restaurant? "...well tease I don't. When the Dirty Vegan dines, she receives plentiful amounts of delicious vegan eatables, and the Melting Pot in Providence, RI was just the place to wine and dine this Naughty lady! 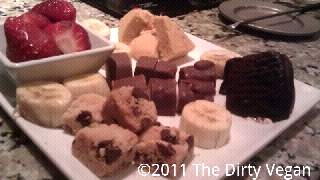 Check out the multi-course vegan meal I was accommodated with! 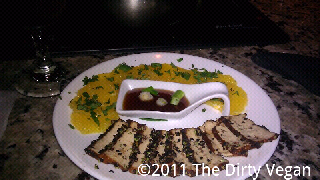 To start, sesame crusted tofu, mandarin, and teriyaki sauce! Some of the fine foods that I got to cook in a scrumptious vegan broth then dip in an assortment of sauces. Prior to this, I had yummy fruits and veggies to dip in a generous pot of vegan spinach and artichoke cheese fondue! Yes, the motherload! Fruits, cookies, cake, and my personal favorite...pieces of Go Max Go candy bars in each assortment!!! 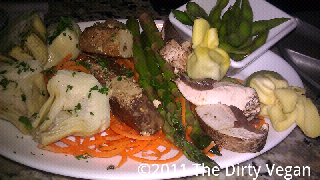 While I cannot promise the red carpet treatment that I received dining as the Dirty Vegan (i.e. my favorite food group, Go Max Go), I can say that yes this restaurant offers vegan options, and they are amazing. I always recommend calling ahead and letting them know you are vegan when making your reservations. The Melting Pot is definitely versed on the vegan lifestyle, as their manager Tyler has experience with vegan diet, cooking and lifestyle (and is such an awesome person! Love him!). This definitely should change the minds of your friends and families who think that us vegans cannot possibly dine with the rest of society (which statistics are beginning to prove that very soon vegetarians will no longer be the minority, we'll be the majority!). The Melting Pot did such an awesome job and I left the restaurant fat and happy! Hope you have a vegan fat kid kind of day. Oh, and stop drooling at your computer! For now, the Dirty Vegan is signing off.